Chereponi District Police Commander, ASP Henry Amankwah Tia providing water to thisty children fleeing the community. WOMEN AND children are fleeing the Chereponi District of the North East Region following the renewed clashes between Konkombas and Chokosis. Reports indicate that farmlands and produce belonging to residents in some of the affected communities have been burnt into ashes causing hunger. Some security personnel had to rescue the struggling women and children with food and water. 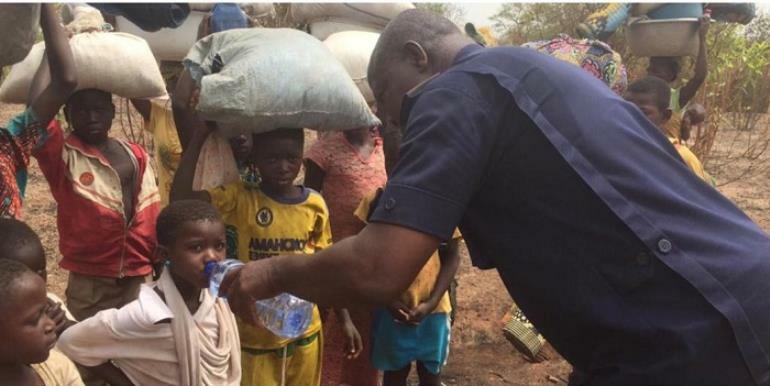 The Chereponi District Police Commander had to provide water for tasty and hungry looking children who were fleeing the area with their mothers. Some families have fled to neighboring Togo and communities which are not affected by the clashes for safety. Reports revealed that several communities have been burnt. So far, four persons have been arrested in connection with the renewed violence. The clashes have reportedly resulted in the shooting of one person by unknown attackers. Jababu Fuad, aged 22, is currently receiving treatment at the Chereponi government hospital. DGN Online gathered that police and military patrols have been intensified in some communities within the Chereponi District of the North East Region.